The left room receives all its lighting via diffusion through the translucent object connecting the two rooms. I would love to see how other renderers (V-Ray, Arnold, RenderMan, Mitsuba, Cycles, LuxRender...) perform in this situation. franz wrote: I would love to see how other renderers (V-Ray, Arnold, RenderMan, Mitsuba, Cycles, LuxRender...) perform in this situation. 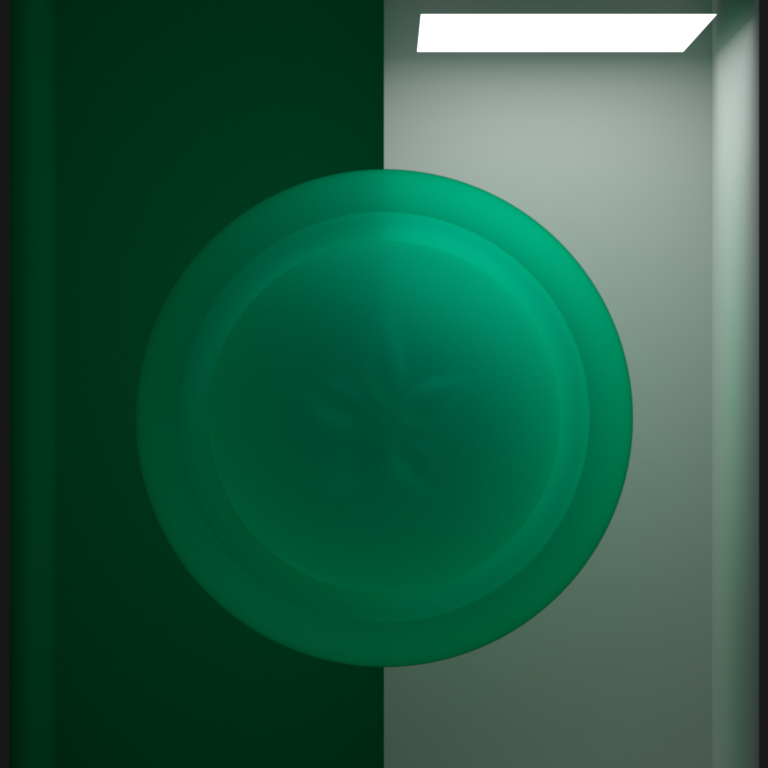 I'm going to try to replicate the test with LuxRender (as soon as I find the time). This would give access to few test cases: Path tracing, BiDir, Path+Metropolis, BiDir+Metropolis, Path tracing on GPUs, etc. LuxRender uses brute force to render volumes: a path can be scattered when traveling inside a volume, if it is, the scattering point becomes a new path vertex (like a new surface hit). How AppleSeed is rendering volumes ? Hey Dade, very cool, looking forward to the test. appleseed doesn't support volume rendering yet. 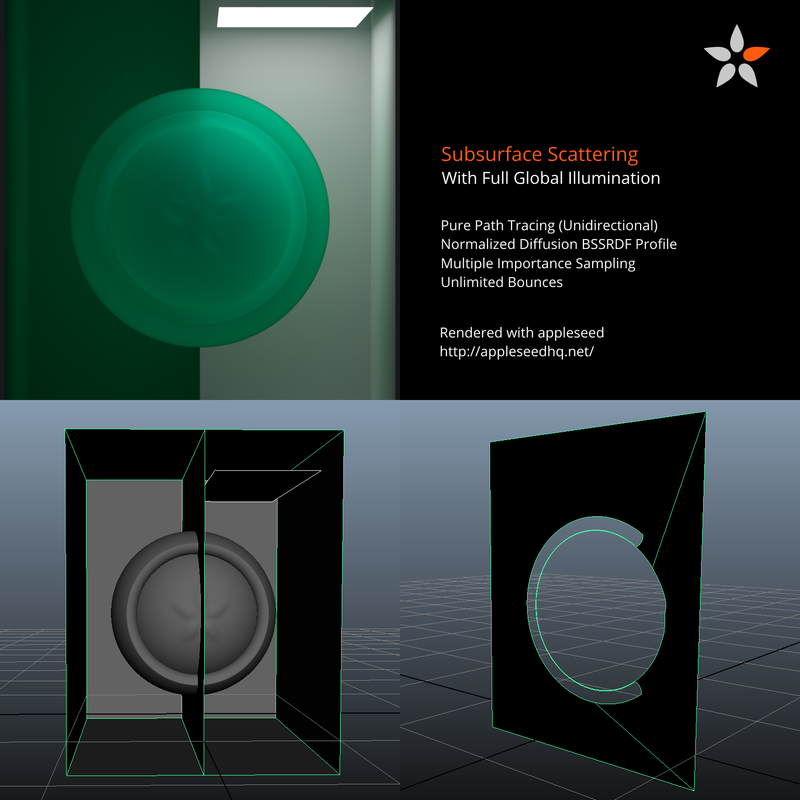 For subsurface scattering, we use the diffusion approximation and have implemented most of the standard diffusion profiles, old and new, with the highest care possible. Here the scene rendered with iray. Materials do only match so much though, as we couldn't really match the look of your picture. So material parameters would help tweaking this. Very nice! Is this based on the diffusion approximation, or is this volume rendering? If the former, what is the diffusion profile? What was the render time? I used a Normalized Diffusion profile; pure translucency, no BSDF (I should redo it with a BSDF to get reflections, they look pretty good in your render). The diffuse surface reflectance is set to 0,178,89 (sRGB). The diffuse mean free path is set to 0.6 m. The index of refraction of the sphere is 1.8. The light radiance is 2 W.m^2.sr^-1. The final image is converted to sRGB. Ah, that will help a lot.. Will post another one with these settings tomorrow i guess..
And its brute force volume rendering, not even using the advanced samplers. Rendertime was around ~10mins i think. Very nice. Is that GPU or CPU rendering? The sphere is probably better treated as an actual volume rather than a diffuse translucent approximation, given how big the mean free path is... By the way, do you have diffuse approximations to translucency in Iray? Cool! Looks good, franz and toxie. god everyones renders look so sterilized like a hospital! max resolution + simplified scene. Surface scratches and some more light sources would definitely help the issue a bit.